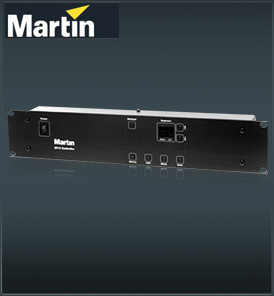 This powerful yet small playback controller handles all Martin lighting products. By combining individual scenes into sequences, the 2510 allows you to build a comprehensive Martin lightshow with a minimum of effort. A standard serial input enables you to download lighting programs from the Martin LightJockey or ProScenium controller. The 2510 offers fully automatic operation and steps through memory sequences with no other prompting other than the internal clock or an external music signal. Manual mode allows for easy operation and a blackout function provides for even more extensive control.